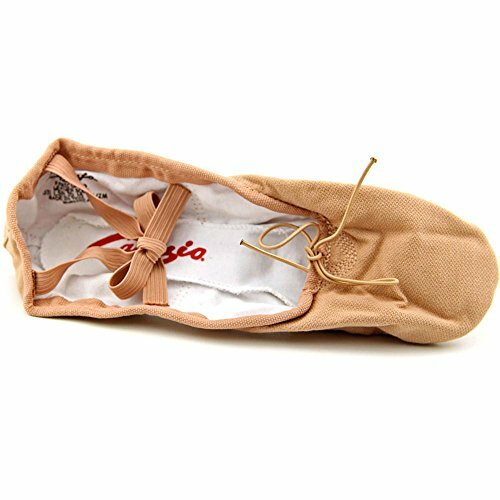 These canvas ballet slippers are a favourite with many dancers. They are split sole and the quality is pretty standard fare for Capezio – nothing to really complain about. Our pair did bunch on the side a little, so be sure to check Capezio sizing charts before ordering (the sizing often tends to run small). The suede sole patches are a tear drop shape and the lining of the slippers are a breathable polyester/cotton (and is softer than other comparable ballet slippers). The FleshTone colour option is a ‘Light Suntan’. This colour is slightly less peachy than the Sansha Pro #1C (Sienna), and is best described as a bold caramel with a peachy undertone. The Light Suntan Cobra would complement medium to light FleshTone dancers. With our most recent order, the elastic cross straps were pre-attached, but when we have ordered Cobras in the past, we needed to sew these ourselves. Prices for the canvas cobra start at $22.50USD. I have no complaints with these, they run a bit small so would order a size up. I’m a male dancer and I use this shoe for rehearsals. I’m probably what people would consider light skinned African American so they suit me well color wise. These do the job, they are nothing special, but having said that, I’ve stuck with them for years now so they must be doing something right.